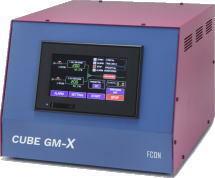 Gas Mixer [CUBEGM-X Series]｜FCON CO., LTD.
Touch panel type Gas Mixer [CUBEGM-X Series]／FCON CO., LTD.
● [CUBEGM-X Seires] is an all-in-one unit which have Touch panel, PLC unit, Mass Flow Controller, Power supply, Valve, Check Valve and Gas Mixer. ● Program operation: Program operation is possible by setting the flow rate and time of each line. ● Alarm function: Alarm sound is notified if an error occurs by any upper / lower limit setting of each line flow rate. ● [CUBEGM-X Series] is a device which supplies a mixed gas species of 2, 3, 4 to set up and control to any of the flow rate. ◀ ［CUBEGM-X Series］ Catalog Download.